One of the biggest advantages that made microstock so popular over the traditional stock agencies was the availability of real-time sales information. It allowed contributors to not only check their daily income quickly but – probably even more important – gave instant and constant feedback to what customers liked, what sold, what made the best return. 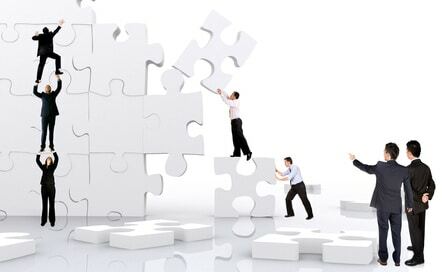 And then focus on their most successful strategies to produce new content. The kind of information needed for this kind of analysis and planning was rather easy to handle when there was one agency selling images within one collection. It became more and more complicated when several agencies came up and your images may have been distributed through several sales channels. Even for iStock exclusive contributors, the analysis has become more and more complex with the transfer of images to the Getty Images website, through the partner program and with the addition of the new subscription offer in March 2014 which only is being reported within the following month. This is where additional offers started coming up. There are several platforms available today, from mobile apps checking for new sales on your iPhone or Android device to sales reporting software running on your desktop computer to web based solutions. Among those, StockPerformer is certainly one of the most sophisticated solutions, offering in-depth analysis of sales across agencies and/or across the different sales channels within the iStock family. Enter by clicking right here! We have got our hands on a 6 month free StockPerformer Eagle account. Enter the giveaway here and share your Lucky URL to get a higher chance to win. StockPerformer is a purely browser based software. It doesn't require any installations on your computer with the exception of a browser plug-in for the data retrieval from the agencies. The software runs smoothly and can be kept open in the background. Unless you only wish to manually update your sales statistics every now and then, it will run in your browser and keep refreshing the data every hour. As it is browser based, it does not ask you to store your usernames and passwords on their server but uses your own log-ins to the agencies. Therefore, you need to be logged in at every agency you want to track in the same browser though you don't have to keep those windows open while StockPerformer runs. Up to date sales statistics are being pulled from the agencies' web pages, and then stored on the StockPerformer database for analysis. It allows you to track your best selling images – on daily, weekly, monthly or yearly basis – for each agency, your overall sales and royalty progress and compare sales with prior years. How can I use StockPerformer for my work? The first and obvious job of StockPerformer is to collect all the data from its different sources: If you are a non-exclusive contributor, getting the daily sales from agencies like Shutterstock, Fotolia, iStock, Dreamstime, 123RF and Pond5 takes some effort by itself. StockPerformer is doing this for you in the background, once an hour or whenever you want it. With iStockphoto, there are additional features allowing you to update the GI Sales, Partner Program sales and the new subscription sales when they have been added to your iStock account. The Overview dashboard allows you to keep track of your daily and monthly sales, across your whole history of microstock submissions. 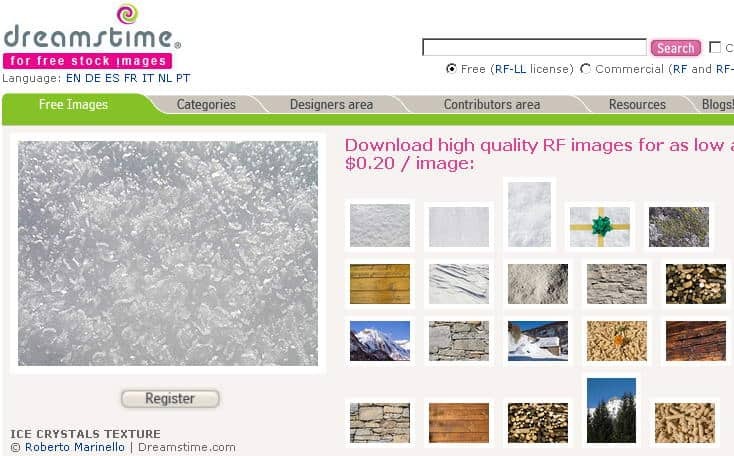 The Top Sales section offers details of your best selling images and the trends among them. It can help you identify which images are making good progress and therefore re-visit the same themes in new shoots. In the Sales Breakdown section, you can find out how many of your images are being sold by subscriptions or credit sales, how your sales are distributed among editorial or creative content or in which time zones your images are being licensed most often. This could also help you plan for future shoots figuring out which types of images do best in your portfolio and which regional markets you are more successful in. The most sophisticated feature on StockPerformer is working with collections: These are summaries of images you want to run combined statistics on. It could be thematically sorted (“My Architecture images”) or shoot based (“Girls go Shopping”). A few weeks ago in September, StockPerformer launched the cross-agency collections. 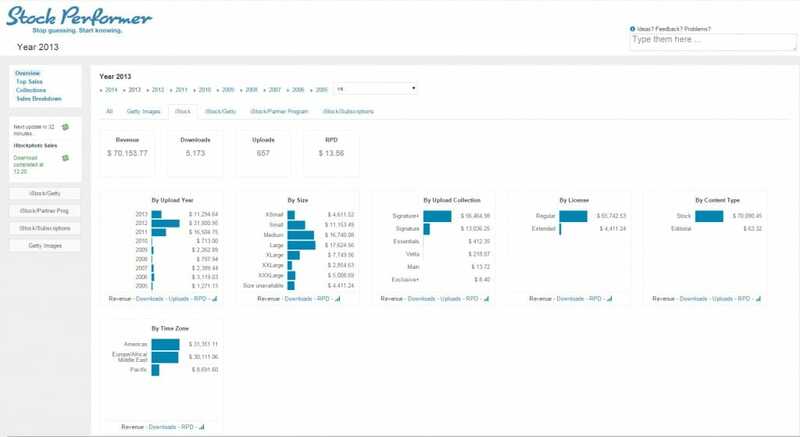 With this feature, you can now even get combined data across multiple agencies. If you are selling your images on several (or all) of the covered agencies, you can run combined sales statistics on the same subset of images, getting sales data to add up. As an advanced feature for the professional users, StockPerformer also allows sharing the information on collections with sub accounts. This could allow larger production companies to make profit sharing deals with their models, make up artists, stylists or producers – just put all images from each shoot into a combined collection and share that information with the people involved in the shoot. Who are the people behind StockPerformer? StockPerformer is being developed and run by Oliver Rivo and Luis Alvarez. Both have a long history in the information technology industry, and Luis also is a very successful iStock contributor. 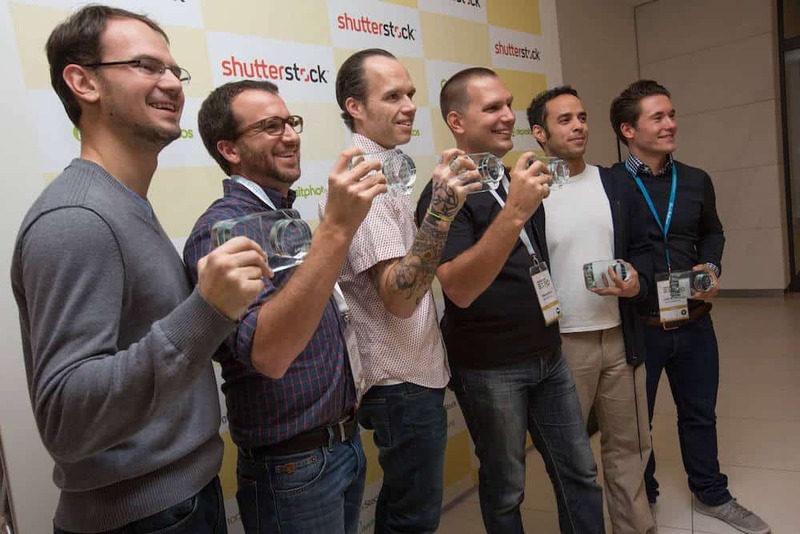 They also share a lot of their insights on their blog, and Luis was a speaker in the Keywording discussion on the Microstock Expo 2013. Their experiences of managing data within a large airline can be found in the whole setup of their data analysis in StockPerformer. At the MicrostockExpo in 2013, Luis & Oliver also have won two of the MEXPO Awards for StockPerformer. Their prices are more on the high-end but they are still reasonable when you are a professional stock photographer. They even offer a 30-day free trial – register your free account now! Sparrow – €7.50 a month (billed yearly) or €9 month-to-month. This account is a great if you want to start tracking your earnings. 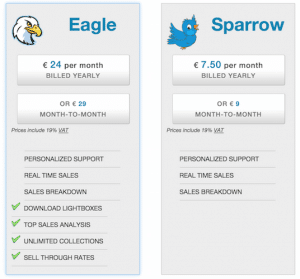 Eagle – €24 a month (billed yearly) or €29 month-to-month. This is the way to go if your seriously earn (or want to earn) money from stock photography. This account is a must have to analyze collections, get top-sales reports and see sell through rates. Cancel Any Time – If you cancel your plan, you will not be billed again. Yearly memberships expire automatically at the end of their period. StockPerformer is a well crafted product but there always is room for improvement. We found the number of agencies covered is rather small: So far StockPerformer covers iStockphoto, Shutterstock, Fotolia, Dreamstime, Depositphotos, 123RF and Pond5 – the latter probably only making sense for contributors offering footage. For those who submit to Stocksy United, those sales are added as well, and the iStock support includes details for the GI Sales, Partner Program and the new iStock subscriptions which goes well beyond what iStock offers themselves. For non-exclusive contributors, among the microstock agencies, we would wish at least the top 8-10 according to the MicroStockGroup polls would be covered. Going beyond that probably does not make too much sense economically as the sales are becoming more and more random, the less an agency sells. Also, the cross-agency collections are a great start but they could use a few more refinements. At this stage with the data available you can start adding numbers you have made from a specific set of images (e.g. a single shoot) but the statistics are hard to read as sometimes images are not accepted at all agencies or a subset of the collection is being sold exclusively at one agency while others are available among many. 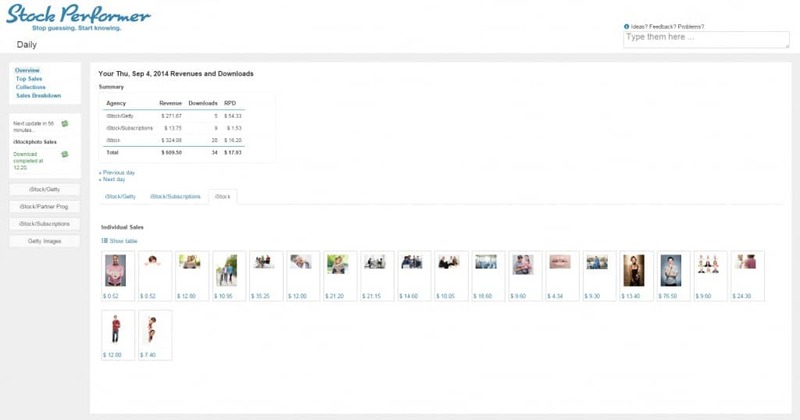 So for the future, we are hoping for the ability to connect images between agencies directly to show all sales for each image on a single detail page. StockPerformer is an all around well done product and can be very useful in optimizing your work flows and distribution channels. It comes at a rather high price compared to the simple tools you can also download or buy. But it can't be compared with the “alarm bell ring tone” apps telling you when you have made another subscription sale somewhere. It is meant for those who want to go beyond just a few nice graphs and statistics of what sold. The Sales Breakdown and Collections sections offer in-depth analysis options for those who take microstock serious and want to get the most from their efforts. If it helps someone making $500 or more in royalties each month to make 5% more revenue from each of their shoots, it will probably pay off very quickly. However, you can find out yourself by testing the full service for the first 30 days completely free. And after that you can decide between two offers, a limited “Sparrow” edition and the full blown “Eagle” account. The tools available are easy to start with and allow fine tuning and personalization to achieve the statistics each contributor wants to see. The pricing is rather on the high end for a statistics tool. StockPerformer targets the higher end contributor range and is probably too expensive for hobbyists to just have a look what they sold. Also the agencies covered could be extended to include a few more. Overall: For contributors serious about stock photography and analyzing their sales to get better returns on their work, StockPerformer is a must have.